A must for any fan of the classic Hanna-Barbera cartoon characters! His voice can be heard in countless classic animated cartoons, still seen on TV daily around the world. He was Yogi Bear, Huckleberry Hound, Quick Draw McGraw, Baba Looey, Super Snooper, Blabbermouse, Snagglepuss, Augie Doggy, Mr. Jinks, Wally Gator, Elroy Jetson, Cap'n Crunch and hundreds of others. He worked with nearly every major animation director, including Messers Hanna and Barbera, Jay Ward, Walter Lantz, Chuck Jones, and Tex Avery. He worked puppets for Bob Clampett (Beany and Cecil). Fans included Groucho, Harpo, Lionel Barrymore and even Albert Einstein. His collaborations with satirist Stan Freberg sold millions of records. Yet you have probably never heard of him. His name is Daws Butler. Dawes Butler, Characters Actor brings you up close and personal into the life of the man who many consider to be the greatest voice actor of the 20th Century. 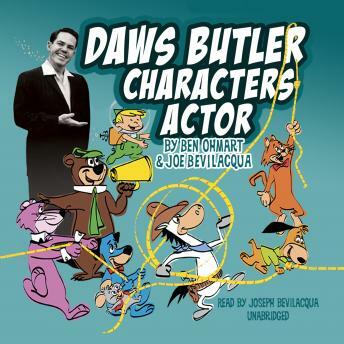 This audio biography is lovely narrated by Daws Butler protege Joe Bevilacqua (Joe Bev), who co-wrote the book with Ben Ohmart. Joe Bev also demonstrates many of Daws' character voices along the way. This authorized biography includes detailed eye-witness accounts and personal reminisces by his colleagues. Best of all, the book includes the words of Daws Butler himself telling his own story. How did Daws create the voice of Huckleberry Hound? What did comedian Bert Lahr think of Snagglepuss? Who made the first Cecil puppet? What was the Daws Butler Workshop? What was it like having Yogi Bear as a dad? 'Is there any question the name Daws is plural? No single human being could have created so many amusingly convincing voices as did the talented, singularly plural Daws Butler. For Daws, the term 'genius' must perforce be exponentially multiplied: voices times voices times voices, and so on. I am flattered and honored that he based Fibber Fox on me.' Shelley Berman, actor ('Curb Your Enthusiasm'), Standup Comedy Pioneer and founding member of Chicago's 'Second City'.